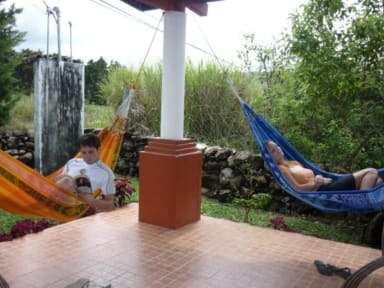 The plusses: A room for two at the price of a regular hostel, with a nice kitchen, living room and nice hammocks to spend some time. Charlie, who runs the place, is very helpful and can arrange a lot for you. We were only with a few people and had dinner together daily, which was nice. Its a beautiful place in feels like your in a house more than in a hostel. The things that could be better : When I was there it was very quiet. The only people there were me, Charlie and a volunteer. Not at all a busy place during my stay at the end of June. Shared taxis are frequent and cost only 60 cents, but after 1 night I decided I would be better off in a hostel in Boquete itself. Also no breakfast. Hostel is far out of town so can’t do anything outside the hostel without taking a cab. During my stay the staff left for groceries for 6 hours(!) en left me and a girl in charge. It’s a nice place to chill and go to bed early .